Oil Painting Medic: Why are There Dull Patches on my Oil Painting? The surface of a freshly completed oil painting will often dazzle the eyes with deep, saturated colours and a glossy finish. A week or so later, however, the wet look has gone and dull patches begin to appear on the oil painting. Colours lose their vibrancy, particularly dark pigments. How can the artist put right an oil painting that has become dull or patchy? The artist may feel disheartened when dull patches begin to form on the oil paint surface. 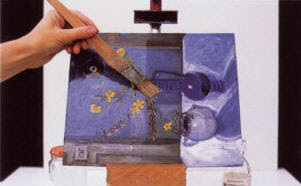 Parts of the painting remain glossy, as though just painted, but others become matt, creating an unpleasant patchy finish to the oil painting. What is the cause of dull patches on an oil painting and what can be done? Known as “sinking,” a patchy oil painting is often due to the oil in the paint being sucked into an absorbent painting surface beneath. The following practices will cause sinking. Painting straight onto an unsealed surface, which may be canvas, wood, board or paper. Using cheap industrial or household primers to prepare the painting surface. Not sizing the painting surface properly, such as over-thinning the primer or gesso, or spreading it too sparingly over the painting surface. Using too much solvents with the oil paint mix, such as when applying glazes or oil washes. Some pigments will dry with a more glossy finish than others. Dark colours, such as burnt umber and ultramarine often dry matt. Crimsons, such as permanent rose often retain their gloss when dry, which may account for a patchy oil painting. The artist need not worry if the painting surface has been properly sealed (or sized). This might be a gesso size, rabbit skin glue or (what I most often use and would recommend) artists’ primer, or acrylic polymer primer. This is sometimes labelled “gesso,” which is confusing, but acrylic polymer primer is a white water-based paint that dries water resistant, providing a tough, waterproof seal onto which the oil paint can sit. Applying the primer with a wide brush and allowing it dry before applying a second coat is all that is required. The great thing is, the paint brushes can be washed in warm soapy water afterwards without having to use solvents. Firstly, allow the oil painting to dry thoroughly. This will take at least six months. Dribble a little linseed oil onto a dry, clean, soft cloth. Gently apply the linseed oil onto the dull areas by using soft strokes. This will help nourish the parched area with fresh oil. Allow the oil on the painting to dry for a few days. If the dry patch returns, repeat the process. Several applications might sometimes be necessary, particularly if the painting support is very absorbent. In most cases, a patchy oil painting will be corrected by the application of artists’ varnish, which will reinstate the oil painting’s previous wet, vibrant look. Many artists consider the varnishing process to be the final touches to an oil painting, but oiling out as described above will nourish the painting prior to varnishing. Most artists use gloss varnish for oil painting. This will certainly rid of the dull patches. But if the artist does not wish for a high gloss, as is often the case with abstract art or contemporary art, matt varnish or even satin (a finish somewhere between gloss and matt) can be used. In both cases, the patchy appearance of an oil painting will disappear once the varnish has been applied. Can I use a satin varnish over a gloss varnish. My painting is too glossy. I used retouch varnish. If I were you, I would remove the gloss varnish first. Ovelaying one type of varnish over another could cause problems with the two adhering, and the gloss could show through anyway. Remove the gloss varnish carefully with proper varnish remover, working over the painting a little at a time with cotton buds. This should be easy as retouching varnish is not meant ot be permanent.